I finally got around to moving the blog to a different location on our website. This has been something I have been meaning to do for a while now, but was put off at the thought of loosing my web traffic. 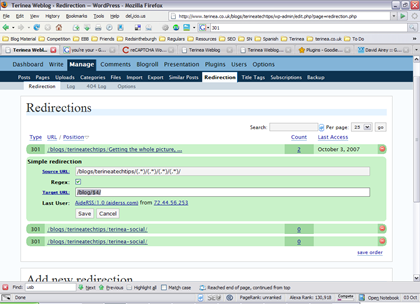 But fear not, using Redirection plugin you can keep the traffic flowing. Before you skip over this post, because you’re not moving your blog, think again. The Redirection plugin has a very nice feature that allows you to redirect 404 pages, which is just a technical name for missing pages caused by broken links. The plugin logs any occurrences of 404 pages along the URL address of the page requested. To stop this happening again, you simple provide the 404 record with alternative location. For example I noticed that the following page had been requested a number times. Up until this morning this would of resulted in 404 page being displayed. Now it redirects to the correct page. For a while now I’ve been wanting to move the blog from http://www.terinea.co.uk/blog (we use to have two blogs, other one was called TerineaTimes) to http://www.terinea.co.uk/blog for a number of reasons. I also wanted to change the permlink setup too. But before you install the plugin, make sure you have a complete copy of your blog in the new location. Once you’re happy, download Redirection plugin, install and watch the video on how to use the plugin. I hope that’s clear as mud? Any readers on David Airey’s fantastic blog will know, that Google doesn’t like duplicated content. So not only does the Redirection plugin redirect traffic to the new blog posts, but it also tells Google and other Search Engines that the page has permanently moved to a new location, using a 301 code. Hopefully after a while they will re-index these pages. You must also remember to update your Feedburner feed and integrate it into your blog template. Unfortunately one thing you can’t change is the URL of your Technorati account, so hence I’ve had to create a new blog, which is now sat at 3 rather than my pervious 176! 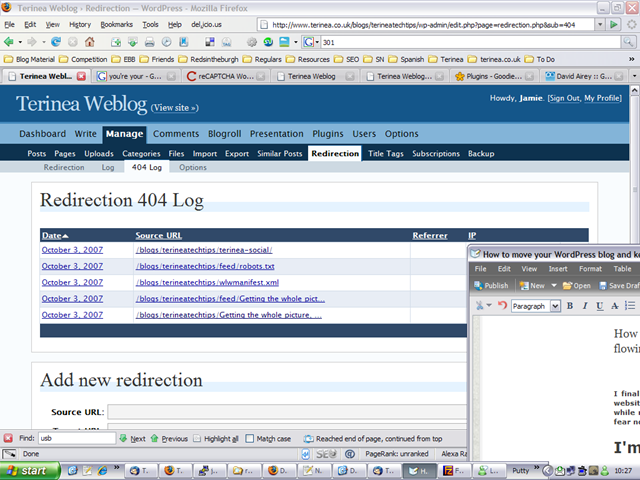 I wasn’t so familiar with the redirection plugin, so thanks for the write-up, Jamie, and good work on your relocation. It is also good plugin if you ever want to re-write an article and have any traffic from the old one redirect to the new one.